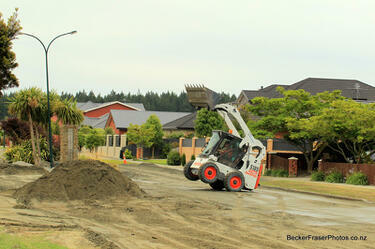 A photograph of a front-end loader on Bower Avenue in New Brighton. 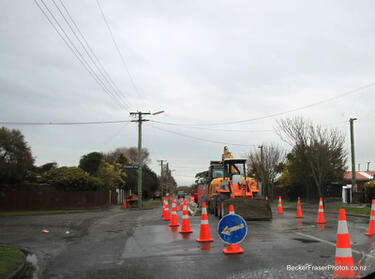 A photograph captioned by BeckerFraserPhotos, "An imaginative way to indicate a sink hole on Bower Avenue in New Brighton". 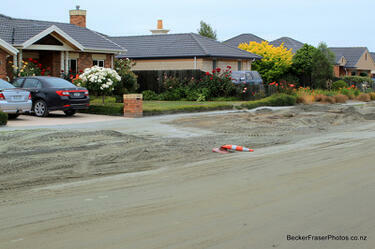 A photograph of liquefaction in a residential street, captioned by BeckerFraserPhotos, "Bower Avenue, New Brighton". 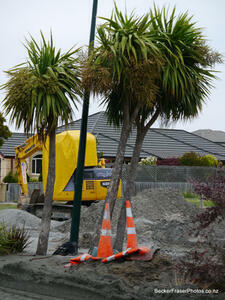 A photograph captioned by BeckerFraserPhotos, "Three trees on a lean at Bower Avenue in New Brighton". A photograph captioned by BeckerFraserPhotos, "Forest Park on Bower Avenue in New Brighton. The silt on the road was awful, but most people's gardens were relatively unscathed". 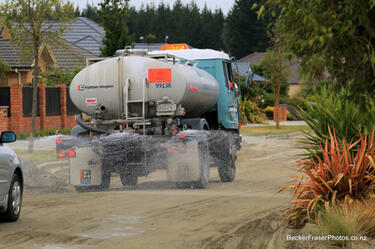 A photograph captioned by BeckerFraserPhotos, "A truck spraying water to keep the fine insidious liquefaction dust out of the air along Bower Avenue in New Brighton". 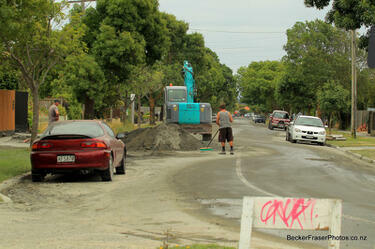 A photograph captioned by BeckerFraserPhotos, "Orion workers in Bower Avenue, New Brighton". 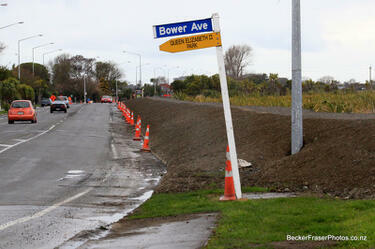 A photograph captioned by BeckerFraserPhotos, "Note the extent of liquefaction in Bower Avenue in New Brighton, but the garden appears to be untouched". 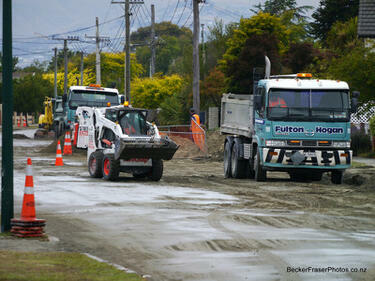 A photograph captioned by BeckerFraserPhotos, "Road works on Bower Avenue in New Brighton". 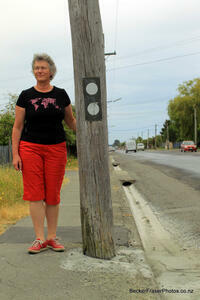 A photograph captioned by BeckerFraserPhotos, "Moira Fraser standing beside this pole to show the normal height for the marker with two round luminous spots which is at ground level in the previous photo". 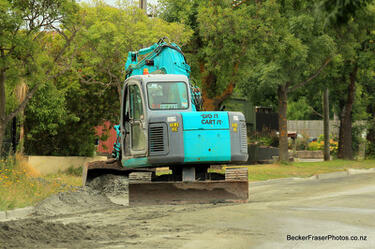 A photograph captioned by BeckerFraserPhotos, "Flemington Avenue in New Brighton with a digger and a pile of liquefaction. Most of the rest of the liquefaction has now been removed from the street with the help from the Student Volunteer Army". 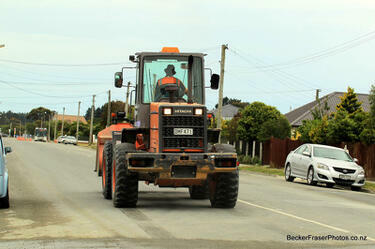 A photograph of a front-end loader driving down Bower Avenue in New Brighton. 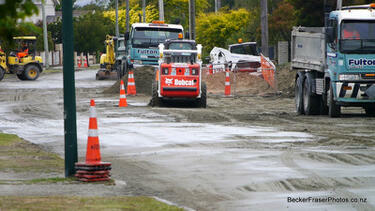 A photograph of a digger scraping liquefaction from the grass verge of Bower Avenue in New Brighton". 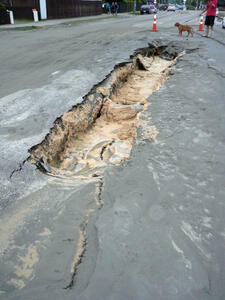 Road damage and liquefaction in a residential street. The photographer comments, "A great gouge in the road caused by liquefaction undermining the road surface and a car driving over it. 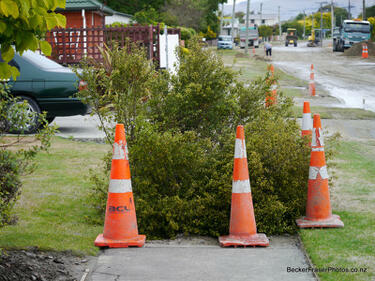 This was the earthquake in Christchurch, New Zealand on 22 February 2011". 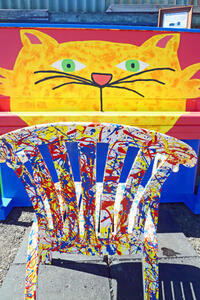 A paint-splattered chair sits in front of a brightly-coloured piano painted with a cat's face, part of Gap Filler's Painted Piano Project. The photographer comments, "Gap filler I believe has created three sites filled with a stage area, seating and a piano. This one is at the Junction of Bower Ave and Marine Parade on the site of the demolished TJs Kazbah and opposite the now demolished Ozone. They have really brightened the corner up and we just need a few people to gather and have a nice night of it". 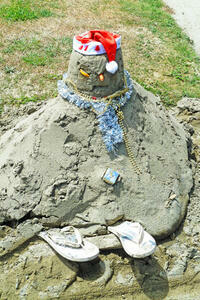 A pile of liquefaction silt in Parklands has been decorated with a Santa hat, Christmas decorations and a pair of jandals to form a silt 'snowman'. The photographer comments, "Not the most welcome Santa to find on your doorstep on Xmas Eve. 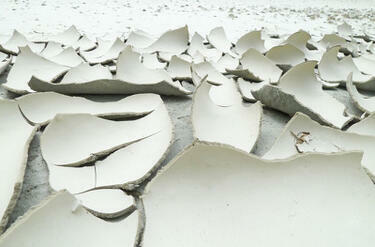 This was made out of damp liquefaction in Parklands". 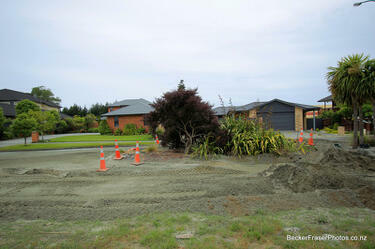 Dried liquefaction silt in North New Brighton. The photographer comments, "The liquefaction after the 23 December earthquake in Christchurch started to dry out and the thicker deposits started to curl up like broken drain pipe".